Autumn is a lovely time in Alberta; the leaves are changing and the harvest season presents a bounty from farms and greenhouses across the province. Last week, 124th street’s Canteen hosted the latest in the Taste Alberta – Prairie on the Plate dining series with a $55 four-course autumn feast designed by chef Ryan O’Connor. When we arrived, our table was excited to learn that Canteen had their happy hour prices on for the event which included three Alberta craft beers on for $5: Bench Creek Brewing Cloudbreak Hopfenweizen, Yellowhead Brewing Company Lager, and Alley Kat Brewing Company Buena Vista Brown Ale. Canteen also had three glasses of white and red wine on for $5, but the drink that I found most enticing, as did my table, was the Eau Claire Distillery (from Turner Valley, Alberta) Gin with Porter’s Grapefruit Tonic for $5. For our introductory course, chef Ryan O’Connor explained that Alberta Pulse Growers had donated the pulses for his yellow pea falafel. Cooked in canola oil and served with a side of herbed creme fraiche, the dish also represented two other Taste Alberta commodity partners – Alberta Milk and Alberta Canola. I snuck into the kitchen as the second course of the evening was being prepared, which gave me an opportunity to catch chef Ryan O’Connor and his brother Sean O’Connor, executive chef of Canteen’s sister restaurant the Red Ox Inn, stirring things up. I think I learned the secret to the brother’s Spätzle – it is tossed in a generous serving of butter (something that I am sure will make the dairy farmers of Alberta happy). Heading into the kitchen between courses can be dangerous. I was seriously tempted to steal a portion of pork belly once it came out of the oven. Once the dish was plated and served, Chef O’Connor explained that we would be enjoying confit Irvings Farm Alberta Pork belly with dill Spätzle and braised purple cabbage. Chef O’Connor sourced all the vegetable for his autumn harvest dinner from Reclaim Urban Farm. Sadly I missed out on the Spätzle, but I did get to enjoy my Irvings Farm pork belly with a gluten-free modification featuring Brussels sprouts. Our main course was a comforting dose of meat and potatoes. Chef O’Connor braised Four Whistle Farms beef short ribs which were served up with charred onions and a potato pave. The dish was accented with a green peppercorn aioli – a sauce I certainly would have bought had they offered us the option to take home. The dessert was my favourite dish of the evening. 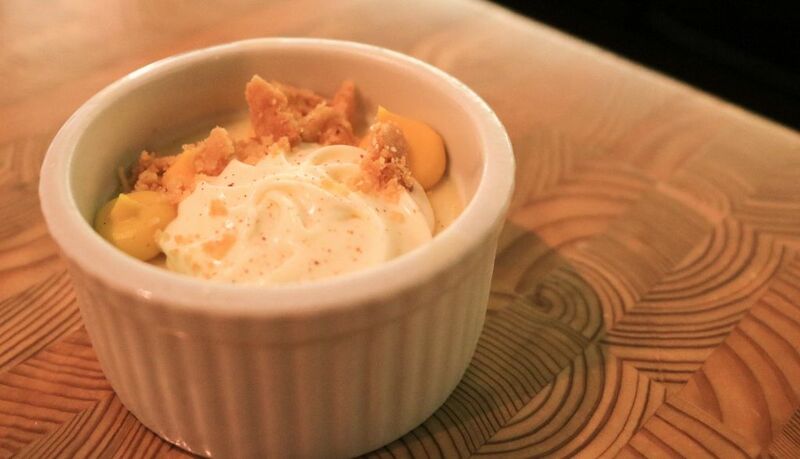 I’m not a die-hard chocolate fan – I prefer fruity or creamy desserts, so chef O’Connors pumpkin spiced pot de creme (which featured Egg Farmers of Alberta and Alberta Milk) was the perfect way to finish my autumn feast. I was so pleased when co-owners Andrea and Frank Olsen wanted to host a Taste Alberta – Prairie on the Plate dinner at Canteen. For me, the 124th street restaurant is home to one of the best brunches in Edmonton – and I forget to think of Canteen as an evening option. Chef Ryan O’Connor’s autumn feast was a good reminder – I need to come in for dinner more often. Nothing but brotherly love in the kitchen at Canteen. Thank you all of the Canteen family for hosting a delightful meal on a crisp Wednesday night in October. I also learned that Canteen is offering a happy hour menu from 5 – 6 pm everyday! Check it out – I’d be happy to meet you at the bar. Great event. I loved the Spätzle – first (and hopefully not last) time I had that dish.